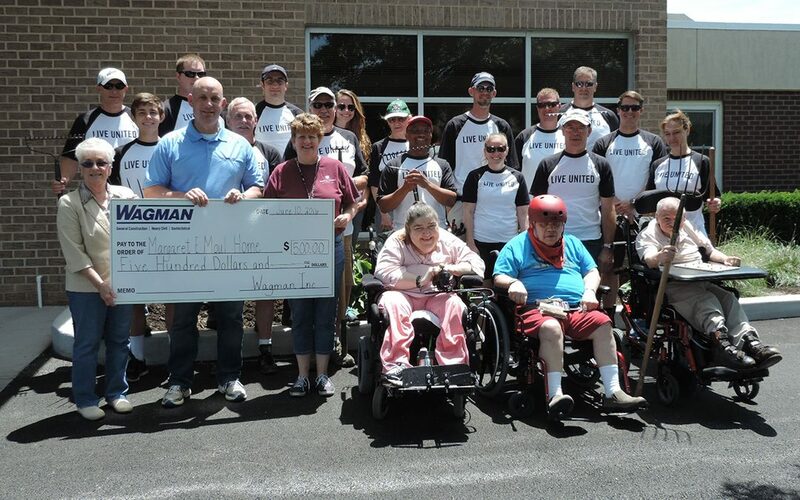 A team of volunteers from Pennsylvania-based Wagman, Inc., Wagman Heavy Civil and Wagman Construction, took part in a June “Day of Action” for the United Way of York County. Seventeen employees spent the day improving the landscape at a long-term care facility for adults with neuromuscular impairments, including cerebral palsy, spina bifida and multiple sclerosis. In addition to volunteering, Wagman CEO Mike Glezer presented the Margaret E. Moul Home with a check from the Wagman Corporate Community Fund. Wagman was a 2015 ARTBA Foundation “Helping Hand” Award winner for its long-time corporate giving programs. The firm provides financial support to more than 50 non-profit organizations each year, as well as matches employee charitable contributions and encourages employees and board members to volunteer for charitable causes. See last year’s video on the Helping Hand Awards honoring Wagman and other ARTBA member companies for their extraordinary community-based programs.